Successful rat trapping is all about placement of the traps, not the bait used. 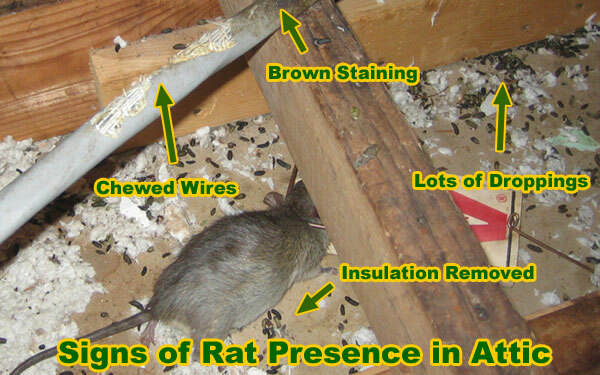 The traps should be set in the areas of high rat activity, denoted by droppings, brown grease marks, and in in an attic, runways carved into the insulation. Set the traps on these areas, especially near edges that rats run along, and you don't even need to bait the trap. Furthermore, if you properly seal a house shut and seal some rats inside the building, then they are much easier to trap. That said, I like to use peanut butter on traps. It's easy to use, they like it, and it preserves well. Some other people swear by chocolate or slim-jims. Before you even begin to think about rat trapping, there are so many other things to concern yourself with. For example, without first eliminating any means of the rats themselves getting into your house, you are still likely to have a rat problem, even if you manage to trap a hundred of them. Also, if you still haven’t learned how to protect yourself against rats, and prevent them from making an unexpected and unwanted entrance, you will again, still have a rat problem. Before you even begin to think about buying traps, there are so many other things that you will need to take into consideration. We shall start with some rat knowledge. Firstly, did you know that they can actually grow up to nine inches long in good conditions, but can still climb through a gap that you probably couldn’t even poke your fingers through? That is going to be one of the first things that you are going to have to think about when buying a trap. Secondly to that, when you see one rat, there is always going to be more. They have a habit of following each other. On top of that, they are incredibly destructive which means they are going to wreak havoc in your home. This also means that you need to think about the style of trap that you are using – they will be able to gnaw their way through most materials. Many people think that a professional pest control company isn’t required to get rid of a rat problem. Admittedly, you can set traps and take preventative methods yourself but rats bring with them some truly awful diseases, (you all know about the plague in history!) and can contaminate your food, bring some nasty parasites into your home, and even leave disease in the structural damage that they can cause in your home. Don’t you think that it is time that you called a pest control company now? This is very much so the case if you have pets in your home, or children to think about! Is it really worth taking the risk of trapping these creatures yourself? Of course, if you are still adamant that you want to trap and eliminate these creatures yourself, you are going to need all the help that you can get. There are three main points that you are going to want to take into consideration – the animal that you are trying to trap, the size of the trap that you are going to need, and the features that are present in the traps that you are looking at. One of the most successful styles of traps for rats is one that has two entry points. It is basically a long wire square with doors at either end, so that when the rat enters the trap, both traps slam shut. It gives them the impression that it is walking through a tunnel, almost like a pipe, and has been shown to be very successful. Of course, there are one door traps, and traps or large and small sizes that you can think about as well – if in any doubt, always consult a professional. Information about Rat Trapping Tips - location is key. Information about how to keep rats away - prevention techniques. Information about how to catch a rat - remove one stuck in the house. What is the best bait to trap a rat? Commonly the rat traps are baited using peanut butter, cheese and bacon etc. Some of these provide excellent results in certain situations while other do not, live up to the expectations. The big question now is that what is the best bait to trap a rat? To be honest the best and most appropriate choice of the bait of rat is actually dependent upon the type of rat, which you are intending to capture. Yes, it is true different types of rats have their own preferences and eating habits and you have to be very much careful before setting up a trap. In this section, we will highlight ten easy and affective tips related with the appropriate bait which should be used for trapping rats. Black rats are normally vegetarian whereas brown rats prefer plant as well as meat this shows that different baits will have different affectivity in catching different types of rats. You should give a good look to the type of rat, which you want to capture. In situations where you are forced to capture more than one type of rats the ideal bait will always be plant food like peanut butter. Using the same bait again and again is always very good. Rats actually don’t vomit so for avoiding poisoning, they only consumer new food in small amounts. Chances are always high that they will take bait, which they have already eaten. If rats smell food upon the breath of another rat’s it will eat the food. In reality rats need a combination of carbon disulphide as well as the odor of food for feeling comfortable during consuming new foods. Once a rat consumes bait other rats will not show hesitation in taking it. For making this happen you should take proper steps. Don’t make any kind of mistake because it will cost you very much. The smell of sulfurous attracts rats so you can also use this keeping inconsideration the prevailing situations. A stinky piece of cheese will be very much affective in attracting brown rats so you can take decent advantages. Rats will prefer to eat long and thin foods like pellets or nuggets because they normally hold food in their paws and eat the portion present in middle. Important point to note here is that in smaller amounts rat attractants attract the rodents, but when used in large quantities they will repel the animal. Therefore, use your options carefully for getting decent advanatge of the situation. Don’t use too much of rat attractant and make decent calculations. In case you have problems dealing the animal, then it will be better to call experts who have the skill and experience of handling this task in a decent manner. WildlifeAnimalControl.com is dedicated to providing education about complete, responsible, and humane wildlife removal. It is my hope that you resolve your wild animal conflict in the smartest way possible - effective for you, and as kind as possible to the animals. In some cases, you can do it yourself, for free. In other cases, wildlife removal is complex, dangerous, and subject to various state laws. If you are unable to solve it on your own, consider hiring a hand-picked (by me) professional from my Nationwide Directory of Wildlife Removal Companies, serving over 650 US cities and towns. You can also browse around my hundreds of articles and photos on this site to learn more about solving your particular wildlife problem. You can also feel free to write to me with questions. Thanks for visiting!